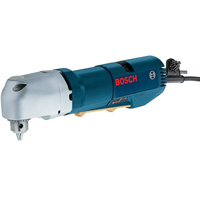 The 1132VSR right angle drill provides an industry leading low profile 3/8 In. chuck for drilling in tight spaces. The tool features 0 to 1300 RPM for optimized torque and drilling speed for the most demanding applications. The keyed chuck properly secures all intended accessories. The short length and low weight (11.8 In. in length and 4.0 lbs.) provide excellent grip ergonomics when using the tool. At 3.8 A, this versatile can also drill up to a 1 In. diameter hole in wood using a Hole Saw bit.